If you think that bargain Bridal Gowns bought online can’t be flattering and that they all suffer from being shapeless and ugly then you’re really far off the mark! You don’t need to spend big on a designer dress in order to get a Bridal Gowns they’ll make you look amazing; in fact cheaper dresses from online vendors are forever improving in quality. What Should An Online Bargain Bridal Gowns Store Have? 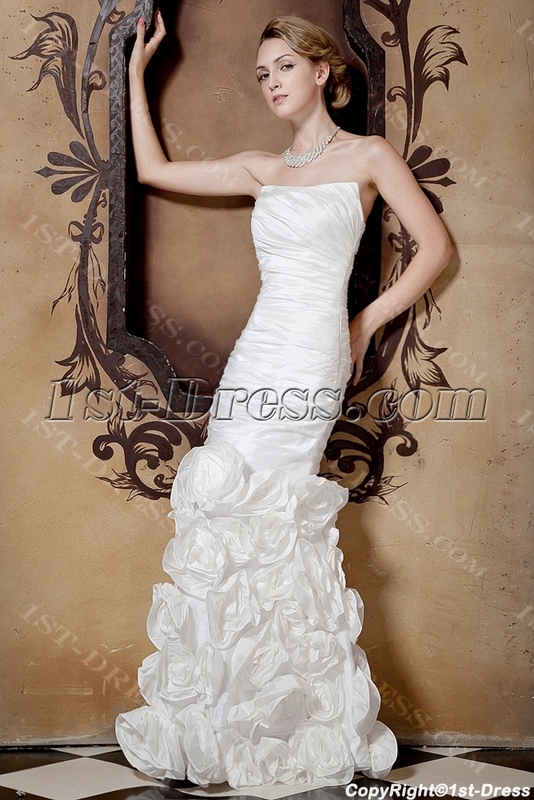 A reputable online Bridal Gowns store should offer a range of dresses of different styles. Each of these styles has individual characteristics and suits a certain body shape. The wedding dress styles you need to look for are Empire, A-line, Ball gown, Mermaid and Sheath. Online stores are generally ALWAYS cheaper than boutiques in town and you’ll be looking for a price of around 250 dollars or less for the dresses to really be classed as bargain wedding dresses. Luckily, this is easily achievable online, even for custom made dresses. You need to prepare a few things BEFORE you even log on to the store. Be sure of your body shape- It’s pretty easy to know your body shape. Check what your widest point is. For instance, if it’s your hips then you’re probably a pear-shape which is the most common shape. Check online videos or a search engine to get an idea. Then when you know your body shape you can be sure to choose a flattering dress (we’ll look into this next). Empire – suits pear and apple shapes and can hide tummies and big bums. A – Line – suits all shapes and can hide tummies and big bums, but is also good for giving balance to broad-shouldered girls. Ball gown – suits most shapes except really petite girls who can be swamped by them. Mermaid – great for slim girls who don’t have many natural curves as it will give some curves. Sheath – good for slimmer shapes and petite girls, but avoid if you’re curvy. Take your own measurements – don’t buy a standard size wedding dress online, always go for custom size. Think about it, your wedding is so important that you don’t want any slip-ups. If you needed to buy a dress that you can’t try on in advance, then if it is made to your size you’re maximizing the chance of there being no problems. In this way you’re actually helping yourself and the store. So you’ve got all of the information and you’re ready to order. Good news! One last point though. Don’t be scared to ask for the store to send you a picture of the dress before they ship it. If they’re reputable they will, and this will let you check if it’s everything you wanted it to be before it makes its way to you. This entry was posted in Bridal Gowns on June 18, 2013 by yczhj2007.